Heads up, gamers: Amazon is doling out freebies as well as discounts this year for Amazon Prime Day. 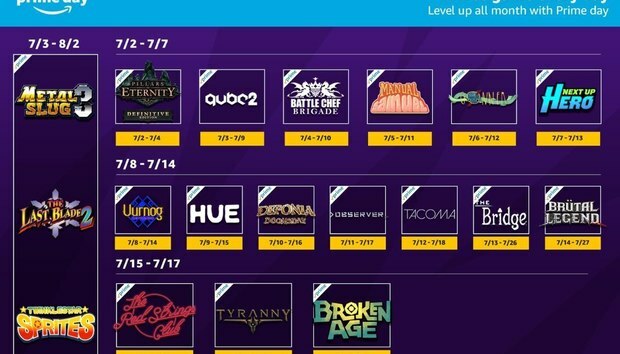 Twitch, which Amazon acquired for $970 million in 2014, has begun giving away 21 games to its Prime members in celebration of the big event. The giveaway will roll out on a daily basis, with new titles available each day until July 18. Most games are claimable for a few days at a time, but several offerings can be snagged during a bigger window of time. Each title will appear on the Twitch Prime page when it's ready for download. Only Twitch Prime members can download the games, which you automatically qualify as if you're signed up for Amazon Prime. (You will, however, need to link your Twitch account to your Amazon Prime account.) Non-Prime members can sign up for a 30-day trial to sample Prime benefits, get access to Prime Day deals, and take advantage of the giveaway. Some of the newer titles on the list are Battle Chef Brigade, Observer, and Tacoma. Observer in particular is a great freebie to snag, if you don't already own it—we rated it a solid 4 out of 5, while Tacoma received 3.5 out of 5. Twitch also announced that some of its top streamers will be playing the games as they arrive. Amazon Prime Day's 36-hour bonanza of discounts goes into full swing on July 16. Stay tuned for more news on Prime Day deals in the lead-up to the event; in the meanwhile, you can read up on the details and get preparation tips, as well as peruse the first batch of pre-event deals. « The Half Nerd ep. 57.5: Why Gordon is wrong, ultimate battlestations, and behind-the-scenes at The Full Nerd!